Afternoon Light on Marriage Hill. Oil on panel, 20cmx 30cm. 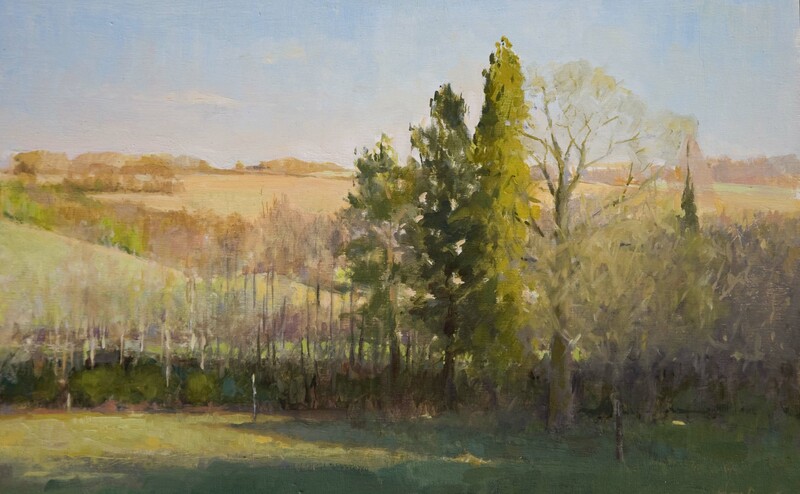 Marridge Hill in afternoon light on a cold but sunny winter’s day is a view I have always wanted to paint and its been around a long time. Almost unchanged since the 16th Century it is British farmland at its best! The hill is made up of chalk which lends well to its reflecting colours from the sun enhanced by the dark trees in the foreground. Painting either in early morning or late afternoon light provides good shadows and a palette that is richer in reds. I hope to post more paintings soon from a recent trip to England! Posted on February 2, 2015 February 10, 2015 Categories Art, landscape paintingsTags England, landscape painting, Marridge Hill, plein air, Wiltshire, winter2 Comments on Marridge Hill, England.